Four billion years ago, the sun was 40 percent less luminous than today. Although Earth and Mars may have been much colder then, Venus may have been the first rocky inner planet to develop warm oceans and a mild climate because it is closer to the Sun. It is even possible that life on Earth may have evolved from life forms ejected from Venus, because pieces of planets were blasted off of each other much more frequently in the early Solar System by asteroidal and cometary impacts, and so microbes from Venus could easily have ended up landing on Earth (Sean Henahan, Access Excellence, February 5, 1997; and David Grinspoon, 1997). 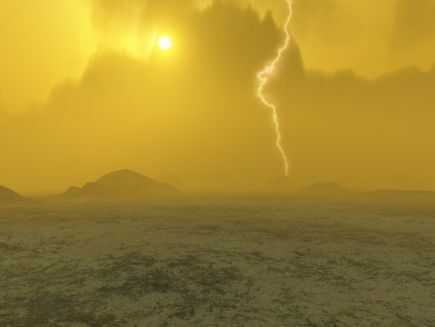 Recent research suggests that the formation of clouds could have slowed the development of the planet's runaway greenhouse effect, allowing Venusian oceans to survive for some two billion years or more. Hence, for roughly half of its lifetime, Venus could have been a habitable planet with liquid water (David Shiga, New Scientist, October 10, 2007). In September 2002, planetary scientists (Dirk Schulze-Makuch and Louis Irwin) made public their speculations that there may be microbial life in the high Venusian clouds (as those in Earth's clouds), based on their finding of atmospheric abnormalities uncovered in data from past Russian and U.S. space probes (Venera, Pioneer, and Magellan). Although Solar radiation and lightning (which has been detected by the ESA's Venus Express probe in 2007) should be producing large amounts of carbon monoxide (CO), the gas was found to be scarce, as if something was removing it (such as hydrogenogens, diverse bacteria and archaea that grow anaerobically utilizing CO as their sole carbon source and water as an electron acceptor to produce carbon dioxide and molecular hydrogen as waste products). The Venusian atmosphere also contains hydrogen sulphide and sulphur dioxide, although these two compounds react with each other and so are not usually found together unless they are being continually produced by anaerobic bacteria decomposing organic matter. In addition, carbonyl sulphide was also found, although it is most easily produced by organic processes. Hence, the scientists suspect that bacteria in Venusian clouds may be using energy from ultraviolet radiation to produce those unusual chemical compounds from carbon monoxide and sulphur dioxide. If they exist, these bacteria could be the evolved descendants of those that developed in oceanic waters on a cooler, early Venus, before those waters evaporated from a runaway greenhouse effect. If the planet's change of climate was slow enough for life to adapt, however, microbes like those on Earth (capable of aerobic and anaerobic biochemical processes involving sulfur compounds exhibited by diverse microorganisms that include autotrophic thiobacilli, methylotrophs, methanogens, and sulphate-reducing bacteria) could have survived, perhaps living today in acidic clouds at altitudes of about 31 miles (or 50 kilometers) where the temperature ranges only from about 50 to 70 °C. Venusian clouds at this altitude are very acidic, but this region of its atmosphere also has the highest concentration of water droplets (Stuart Clark, New Scientist, September 26, 2002). In 2004, Schulze-Makuch and his colleagues announced their speculations that such microbes may survive in Venusian clouds with the help of molecular rings of sulphur to shelter from the Sun's ultraviolet (UV) radiation as Venus does not have a protective layer of ozone in its atmosphere. Patterns of absorption in the UV spectra of Venus suggest that its atmosphere may contain lots of "cycloocta-sulphur", molecular rings of eight sulphur atoms. Such compounds double bonds that readily absorb UV light, then re-radiate the energy at relatively harmless visible wavelengths. The Venus Express mission has been orbiting the planet and investigating its atmosphere since arriving on March 11, 2006. 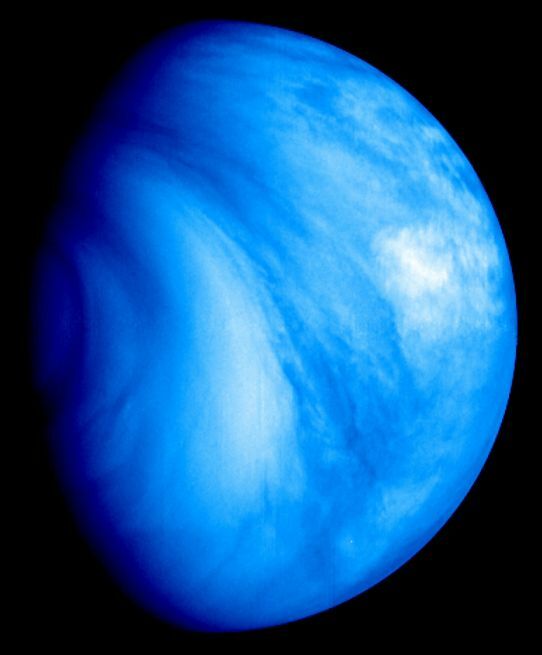 In addition, the Swedish Space Agency has been looking for international partners to develop their idea for a mission to return a sample of the atmosphere from Venus (Hazel Muir, New Scientist, May 3, 2004). about the Western Eistla Regio). In order to determine how long any Venusian oceans might have lasted before its runaway greenhouse effect boiled them off, planetary scientists David Grinspoon and Mark Bullock seek a hardy water-bearing mineral called tremolite on the planetary's as a window into the planetary's past. Experiments by Natasha Johnson and Bruce Fegley, Jr. indicates that tremolite, which forms in the presence of water, can survive conditions on Venus' surface to the present. Based on how long tremolite takes to decompose into other minerals in the extreme temperatures on Venus, Grinspoon and Bullock believe any tremolite found on its surface can be used as a geologic clock for determining how long ago the rocks containing it were formed, and thus how recently water was present on the planet's surface (David Shiga, New Scientist, October 10, 2007). Discussion on life in Earth's clouds from evolutionary biologist Olivia Judson. Try the NASA Astrobiology Institute (NAI). © 1998-2008 Sol Company. All Rights Reserved.